It’s fairly common for UK homeowners to store more than just a car in their garages nowadays. That isn’t to suggest that the family car isn’t valuable but you’ll also find tools and any number of expensive appliances besides. Although the garage door may be as secure as you like, would you be surprised to learn that thieves have taken a liking to entering garages through the roof structure? Britmet understands how distressing the thought of having vandals and other criminals getting hold of your garage belongings can be and that is why we offer some of the very best solutions for this potential threat. For example, Britmet’s Anti Vandal Secure Roof Tiles work just as effectively on your garage as they will on your actual house’s roofing structure. 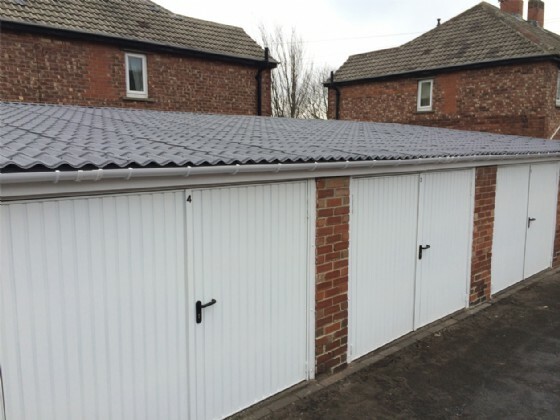 Using interlocking tile panels that have been made from 0.9 mm gauge steel they are perfect for keeping your garage contents nice and secure all year around. We’ll even offer you an incredible 40 year guarantee against the harsh UK weather! Britmet recommend that concerned home owners look into their excellent Pantile 2000 for any garage security roof structure based upgrades. Utilising a 0.9 mm galvanised steel structure, Pantile 2000 is ideal for low pitch roofing structures. You can match your existing roof appearance on your garage with added security. With a full cover width of 1040mm, this actually reduces the installation time and you can have these cut to your desired lengths. Pantile 2000 has been the mainstay of Britmet’s roofing products and has a proud history that stretches back an impressive 27 years. Keeping your garage and its contents safe and sound is now becoming more and more of an issue. Britmet are here to help and we believe that whatever your garage roof shape or style, we have a lightweight roofing solution that will keep those thieves and vandals well away for the foreseeable future. For more information please call our team on 01295 250998.